Bourekas are nothing short of edible perfection — heavenly little parcels of dough crisped with hot oil or melted butter and stuffed with any number of delicious savory ingredients. Nutritious and filling, they make a satisfying meal any time of day. And like Italy’s calzone, Spain’s empanada, and India’s samosa, these pastries are self-contained, which makes them the perfect portable snack to power an afternoon spent browsing through the shuk (Israeli market), or just about any other activity. Originally from Turkey, bourekas (which comes from the Turkish word boerek, or pie) belong within the larger category of small savory pies common throughout the Middle East, North Africa and parts of Asia. They are a favorite dish among Sephardic Jews who serve them on holidays and other celebratory occasions. According to “The Book of Jewish Food” by Claudia Roden, Iberian Jews included bourekas as part of their Sabbath meals as early as the 16th century — a practice that continues today. Bourekas are also popular throughout Israel, both as a breakfast dish and common street food. Bourekas are most often filled with either ground beef, cheese, or vegetables ranging from spinach to eggplant or potatoes.They are traditionally made with a homemade pastry, but in modern kitchens store-bought phyllo dough is widely considered an acceptable substitute. The version below wraps a mixture of chopped spinach and two cheeses in flaky phyllo dough topped with a sprinkling of toasted sesame seeds. Combine spinach, egg, ricotta, mozzarella, garlic and nutmeg in a bowl and mix well. Season with salt and pepper to taste and set aside. Preheat the oven to 350 degrees and lightly grease the bottom of a baking sheet with butter or cooking spray. Place the thawed phyllo dough on a flat surface and cover it with a lightly damp dishtowel to keep it from drying out when not in use. Remove one sheet of dough and place it on a flat surface. Cut it lengthwise into 4 and a 1/2-inch wide strips (you’ll end up with 2 or 3 strips per sheet of dough). Working quickly, brush the dough strips with melted butter. Fold one side of the strip over lengthwise to meet the other (like closing a book) and brush again with more butter. Spoon 1 teaspoon of filling at the bottom end of each buttered strip. Fold the bottom right corner of the strip upwards, towards the left edge to make a triangle. Then fold the triangle over to the opposite side. Continue folding upwards in this manner until you are left with a fat triangle with the filling tucked safely inside. Brush the outside of the triangle with a little more butter and place on the baking sheet. Repeat with additional pieces of phyllo until all of the filling is used up. 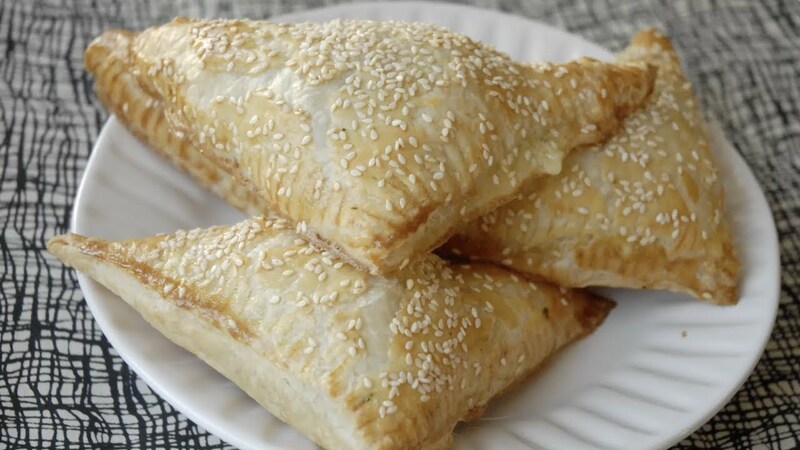 Just before baking, brush the filled borekas with the beaten egg and sprinkle with sesame seeds. Bake until golden brown, about 20 minutes. Doughy little pockets of heaven filled with cheese and your favorite veggie combination. The ever-popular potato latke heads the list of traditional, oily Hanukkah treats.